Silverfish actually are commonly mistaken for firebrats. They have close resemblances but they are not the same. They’re common names come from the color of their scales and also their movement. The movement resembles that of a fish as well as how their abdomens taper at the end like fish. Silverfish are flattened and elongated. They have long antennae and three long and thin appendages that seem like antennae at the rear end of the abdomen. Silverfish completely lack wings and instead use a squirming, wiggling motion to move. They are born creamy white in color and as they molt, they will change from a dark brown to black to silver with a metallic shine color. Typically they will be seen in bathrooms, attics, basements, closets and in areas that are moist and humid. Having Pest Control is an effective way in removing silverfish. Silverfish go through a simple metamorphosis which means they do not have a larval stage. Instead, they molt as they mature and can molt up to almost 50 times in their entire lifespan. Females can lay up to 50 eggs at one time. They will look for cracks and crevices to lay their eggs in. The eggs take anywhere between 2 weeks to 2 months to hatch. Once they hatch, the nymphs will emerge. Nymphs are typically a creamy white color and look just like fully matured silverfish. They will start to change colors as they molt. Their color will change to a greyish color with a metallic shine. It takes anywhere between three months to a couple years for nymphs to fully mature to adult silverfish. Silverfish are actually one of the few rare species of insects that continue to molt after they mate. Most insects mate after they are fully matured, however, silverfish may continue to molt even after they have reproduced their offspring. Their entire lifespan may be several years depending on the conditions of their environment. Silverfish are the most active during the night and will usually hide during the day. They’re known to roam large distances to search for a food source and so you will often times see them roaming on walls of the bedroom or bathroom and in the kitchen or garages. However, they are not limited to these spaces. They are attracted to a moisture source and humid areas and can survive in different environments, so they can be found in closets and other storage areas. Once they find a food source however, they will remain near that area and will not roam very far from their food source. Silverfish are considered household pests, due to their consumption and destruction of property, having pest control will help you solve this problem. Although they are responsible for the contamination of food and other types of damage, they do not transmit disease. The reason why they are such a problem in households is because they are not very picky eaters. They will eat almost any plant-based material, but they will also eat anything from paper, glue, to flour or grainy materials like cereal and will also feed on fabrics like cotton and silk. They don’t pose a threat to people; however, heavy infestations of silverfish can cause damage to almost any stored material. Silverfish will leave visible holes in paper and books, on the wallpaper and clothes. Their feces can also stain the material that they travel on and move around. They can also create a separation from the wallpaper from the wall because they eat the glue in between. 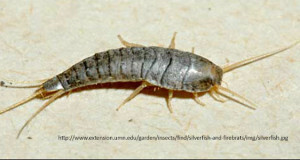 Homeowners detect silverfish when they find one in the kitchen, bathroom or when they are roaming. Silverfish infestations require professional pest control treatment. Swatter Pest Solutions will be able to assess the situation within your home and determine the most effective methods to take care of your specific problem.